Confidence is a beautiful thing. It makes us appear more attractive to others, more in control of our destiny, and more self-aware, among the many other perks it brings to our lives. Above all, a healthy self-assurance is like a visibility cloak — it makes all our skills, talents, gifts or mojos intensified, magnified and easy for people to see. And appreciate them. This is the mere reason why confident people tend to fast-track their personal and professional lives. They believe in themselves and they are not shy to show it off a bit. 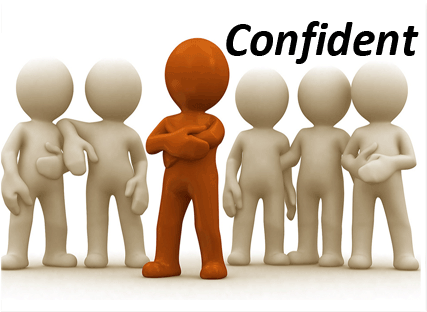 Alternatively, lack of confidence is very much like an invisibility cloak — no matter how smart, intelligent or talented we may be, all others notice right away are our insecurity, indecisiveness, and self-doubting. Similarly, social confidence — or the ability to walk and talk with elegance, to connect with all stripes of people, and to be a skilful conversationalist— is a an expression and extension of our overall sense of worth. Simply, it’s our inner beliefs about ourselves manifested through our outer actions. Unsurprisingly then, a natural way to become more socially confident is to simply improve our self-opinions. However, enhancing our self-beliefs is not an easy task. It is a longer-term (quite strategic and focused as well) approach which often requires profound self-analysis and quite a bit of work, so that we can enjoy lasting and successful results. In the interim state, though, there is still a variety of different ways (or tactical tools, as I call them) in which we can improve ourselves to become more socially skillful and enhance our confidence. Below are just few of actions everyone can rather effortlessly take today. And the great thing is that they are not too strenuous to carry out…with a bit of persistence and practice. This one is very well-established — it relates to the need to know our strengths (and weaknesses), skills, what makes us unique from the crowd. Further, we also need to have a clear view of what our goals and aspirations, our values and beliefs are. Once we have a complete awareness of what we stand for and the image we want to project to the world, all our subsequent behaviors will follow from this core of this cognizance. This is a 3–4 sentence introduction when we meet new people. It’s our chance to give others a glimpse of who we are, what we do, what our goals are, etc. Think of it as your own commercial. If you want people to get interested in you and what you have to say or offer, what (and how) will you say to entice them? No matter what we choose to focus on — our personal brand, on marketing a product, or offering a service, we need to remember to keep it short, interesting, humorous even, but undoubtedly — engaging and enabling further discussion. Probably the easiest way to make others like and accept us is to glorify them a bit and make them feel special in some way. People-reading skills are quite important here since everyone has different soft spots. For one, it may be the way they dress, for others- their cute kids, and for another — their achievements. Whatever the “igniting factor,” we have to try to find it and make a connection. The small talk, although disliked by many, when practiced smartly, can yield great benefits to our confidence as we expand our social network. If done properly, it will make others remember and like us. Humour is not only the best medicine but also the best ice-breaker. It’s no secret that if a others like our jokes, we can quickly become part of the “in-circle.” Everyone looks favourably on people who make them feel better. Don’t overdo it, though — remember that court jesters were not respected for their brains. The art of telling a smart joke lies in intelligence. Hence, read a lot, keep yourself updated and never miss a chance to accentuate your skills and knowledge after a good anecdote. We live in a very material world and that’s barely a secret to anyone. Life is busy, people’s attention spans are getting shorter, snap judgements are becoming more prevalent. If we want to be remembered, we need to make sure we have something to be remembered for. Research shows that it takes few seconds for others to form an opinion of us, and it also comes from the way we dress and carry ourselves. It’s worth it to spare few extra minutes in the morning to make ourselves look neat and composed. Never underestimate the influence looks can have on a materialistic mind. Remembering specifics about people and showing genuine interest in them on a personal level can go a long way. Don’t ignore others based on their perceived importance. One never knows if or when we may need their support. Additionally, they may connect us with other people who can further enable us to achieve our goals. So, word-of-mouth is not a minor detail to overlook. More importantly, though, smiling can help us to appear more approachable, social and upbeat. After all, no one likes the grumpy Smurf. It’s no secret that a straight posture, an eye contact and a head up high are signs of confidence. It is also a way to make a great impression and get noticed. Research supports the idea that non-verbal communication, in the form of posture and gestures, constitutes the largest part of how others see us. More importantly, though, it is related to self-respect and self-assurance. Remember that slouching is not going to make us invisible — it will only make us look insecure and may possibly give us a hefty medical bill from the subsequent back problems. Words constitute a very small — but still significant — part of our communication with the world. The ability to choose the right words, or the lack of it, tells the story of our personality to others, of our brand, and of how willing and motivated we are to succeed. Simply put, the talent to talk the talk is a barometer of how much we (and our brand) are worth to ourselves and respectively — to the world. It shows our self-confidence and how well we can market ourselves. Experts also tell us that, to make a long-lasting impression and to build greater social confidence, we should avoid speaking too fast, should articulate our words and pay special attention to our tone of voice. Another great start to master the skill of a great conversation is to join a professional organization as Toastmaster, for instance. Any chance to speak in front of an audience should be explored as a preparation for the time when we will really need the skills. In the end, social confidence is not something we are born with. It’s true that it may come easier for some to keep up a small chat, to speak up or to unabashedly promote themselves. But with the right motivation (and guidance), we can all learn, grow, and develop into more affable, open to the world and assertive individuals.